Mark Liberman, a computational linguist who directs the Linguistic Data Consortium at the University of Pennsylvania, has been fascinated, especially in recent years, with experimental poetry. You can find his ideas and experiments at Language Log. He's been working on Stein's repetitions. 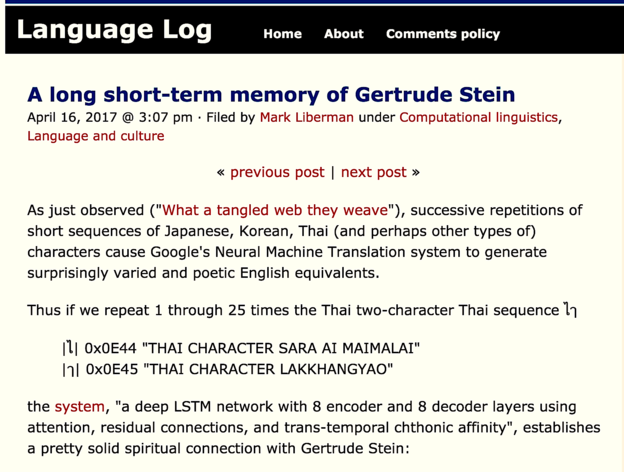 "Successive repetitions of short sequences of Japanese, Korean, Thai (and perhaps other types of) characters cause Google's Neural Machine Translation system to generate surprisingly varied and poetic English equivalents." Click here and listen to what he calls the machine's "pretty solid spiritual connection with Gertrude Stein."